The British pound today rallied higher against the US dollar after the release of upbeat UK retail sales data for the month of November. The pound declined significantly from its daily highs after the Bank of England kept interest rates at their current levels as was expected. The GBP/USD currency pair rallied higher in the early European session to hit a daily high of 1.3466, but later declined after the BoE rate decision to an intraday low of 1.3410. The British pound rallied higher after the release of UK retail sales data excluding auto fuel by the Office for National Statistics in the early European session. The retail sales report excluding auto fuel came in at a monthly rate of 1.2%, which was higher than the expected and previous 0.4%. The retail sales figure came in at 1.5% on an annualized basis, as compared to the expected 0.2%. The pound initially shrugged off the latest Brexit developments where British MPs voted against Theresa May‘s Brexit plan. The announcement of the BoE’s Monetary Policy Committee‘s interest rate decision triggered a slight sell-off in the pound. The MPC voted unanimously to leave interest rates unchanged at 0.50%. The BoE also left its asset purchase target at £435 billion. The currency pair’s short-term performance is likely to be affected by the release of US advance retail sales report and jobless claims data, scheduled for 13:30 GMT. 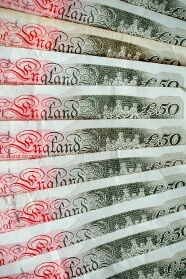 The GBP/USD currency pair was trading at 1.3428 as at 13:19 GMT having declined from a daily high of 1.3466. The GBP/JPY currency pair was trading at 151.28 having dropped from a high of 151.89.